Asha Bhonsle speaks about her young looks and her life and career since the 40s. 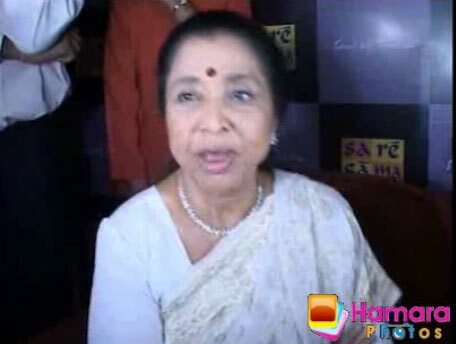 Watch Asha Bhonsle celebrating her 75th birthday. This entry was posted on Wednesday, September 10th, 2008 at 9:06 pm	and is filed under Flash news. You can follow any responses to this entry through the RSS 2.0 feed. You can leave a response, or trackback from your own site. Ashaji epitomises the Alpha & Omega of singing.She has got a golden voice & can still sing for a 16 year old female thus sounding like her.I personally thank God for gifting us not only a wonderful singer but also a good human being.There can be no singer ever who can do justice to any of Ashaji’s songs.It would be unfair to say that she is 75 years old.She is 15 years old with 60 years of experience.She sounds the same as she did in 1940s.She truly exemplifies versatility.She is female version of Kishore Kumar when it comes to singing. ‘LONG LIVE ASHAJI.WE LOVE YOU’. Asha Didi, I love your beautiful voice and your lovely rendition of songs. I am a big big fan of yours and simply enjoy listening to your songs- both old and new. You have a great versatile style and can make even the toughest of compositions sound simple. That’s Asha didi, the most versatile singer ever!! Ashaji is the most versatile and she can be compared to Rafi sahab the great legendary n most versatile playback singer in the Male category……….. Both of them have sung the most number of duets and that is a big bonus and are experts in Classical, romantic, comedy,masthi,sad, ghazal,quavali etc to give us listeners unending pleasure. This statement is not to belittle the sweet combination of Lataji with Rafi sahab with whom the living legend has sung the maximum nummber of duets also but it is less compared to Asha-Rafi…. I don’t agree that Asha ji is female version of Kishore Kumar when it comes to singing but I agree with Deepali as Asha ji is most versatile female singer…Kishore Kumar was great actor and singer but as I think KK was not versatile as Ashi ji……. Ashaji is a phenomenon as even at this stage of her age she can create magical waves in the heart of a person. I agreed with you 100% on this. Keep stick with your Gun. I TOTALY AGREE. RAFI SAHAB IS THE GREATEST SINGER. THEN AFTER A LONG DISTANCE COMES LATA AND THEN ASHA JI. KISHORE IS NOT EVEN ON THE LIST. I do not agree with the order of rating for versatility, because there are more popular and well-sung duets of ASHA JI AND KISHORE DA compared to Ashaji and Mohammad Rafi and Lataji and Mohammad Rafi. Rafi saab was a great singer and some of his song can not be sung by these young singers that we have now. Nonetheless, ASHA JI HAS THE GOD GIVEN VOICE WHICH HAS DEPTH, DARD, GRAVITY AND CAPACITY TO TOUCH YOUR SOUL. We have a lot of classical songs sung by Asha ji and no other singer can hold a candle to her. ASHAJI AND LATAJI ARE LIKE WIND PIPE AND FOOD PIPE FOR THE INDIAN FILM INDUSTRY. ASHAJI ROCKS EVEN TODAY! WE LOVE YOU, ASHAJI!